Landscape with Yellow Birds—the title is from the Paul Klee painting –is a well-conceived collection of poems selected from 17 books of José Ángel Valente’s poetry, ranging from A Modo de Esperanza (In a Hopeful Mode, 1953–1954), Mr. Valente’s first volume of poetry, to Fragmentos de un Libro Futuro (Fragments from a Future Book, 1991–2000) which includes poems written prior to his death in 2000. Born in 1929 in Spain, Mr. Valente took a degree from the University of Madrid in 1953. Given that his family was in diminished standing with Franco, he lived abroad for many years, originally in Oxford, where he taught, then in Geneva, and finally in Paris. During all these years, Mr. Valente wrote poetry and published critical articles. He eventually returned to Spain in 1986, taking up residence in Andalusia. Tom Christensen has prepared a penetrating and complete Translator’s Preface, summarizing Mr. Valente’s biographical details and covering critical areas of the poetry itself, placing Mr. Valente’s work in perspective relative to the Spanish poetry of his time. Various critics agree that while Mr. Valente’s early poetry was associated with the so-called “Generation of the 1950s,” a poetry characterized by Spanish social consciousness, his subsequent work moved closer to the Modernist tradition. One inescapable fact remains: Mr. Valente’s poems as selected and arranged in this collection demonstrate a seamless whole, a unity in which the earlier poems introduce themes and motifs that reappear with renewed intensity and increasing development throughout the collection. Mr. Valente uses his extensive aesthetic vocabulary to work and rework variations on a series of themes: darkness and shadow, ashes and memory, death and passion, blindness and solitude. Themes that engaged the poet in his youth remain central to his mature work. These are poems to be read slowly, filled as they are with nuanced appeals for deeper and deeper reflection. The repetitive patterns and rhythms in many of these poems reinforce, and as they close or resolve, illustrate Mr. Valente’s continued quest for self-discovery. These lines from “Material Memory,” 1977–1978, unite passion with pain, blindness with fire. Written at the mid-mark of Mr. Valente’s poetic career, this quote embodies the mysticism, the opening-up to the sacred that reflects his growing interest in Heideggerian philosophy. Any collection of poems spanning 17 volumes of verse and a lifetime of aesthetic and scholarly achievement is bound to present a challenge, both to the editors of the volume and to the reader. Many poems must be left out of such a volume. The arrangement of the poems selected requires careful judgment and acute linguistic sensitivity, particularly in view of the additional layer of complexity imposed by the fact that this collection is a translation. Despite these challenges the editors and the translator have done a very creditable job in producing a manuscript of smoothly interwoven and carefully translated poems that furnish the English language reader with an excellent picture of Mr. Valente’s work—a remarkable synthesis that grows and deepens with each reading. 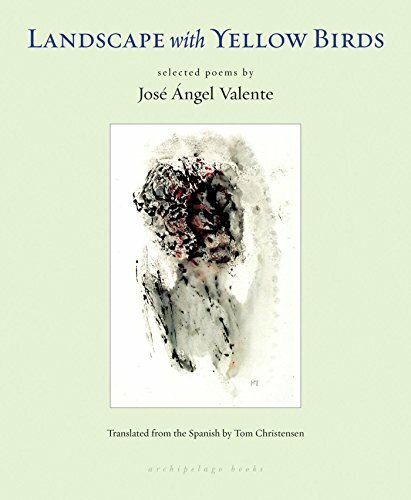 This quote is from The Singer Does Not Awaken, 1992, Part II: “Landscape with yellow birds,” a series of Mr. Valente’s mature prose poems, poems that combine the lyrical certainty of sure poetic craft with the mystical tension—both physical and psychological—of this consummate Spanish poet. This collection is not only an important contribution to Spanish-language poetry in translation, it is a passionate joy to read.